The more pictures ones sees the more it seems that we need to revise our theories of what comets are and how they formed. 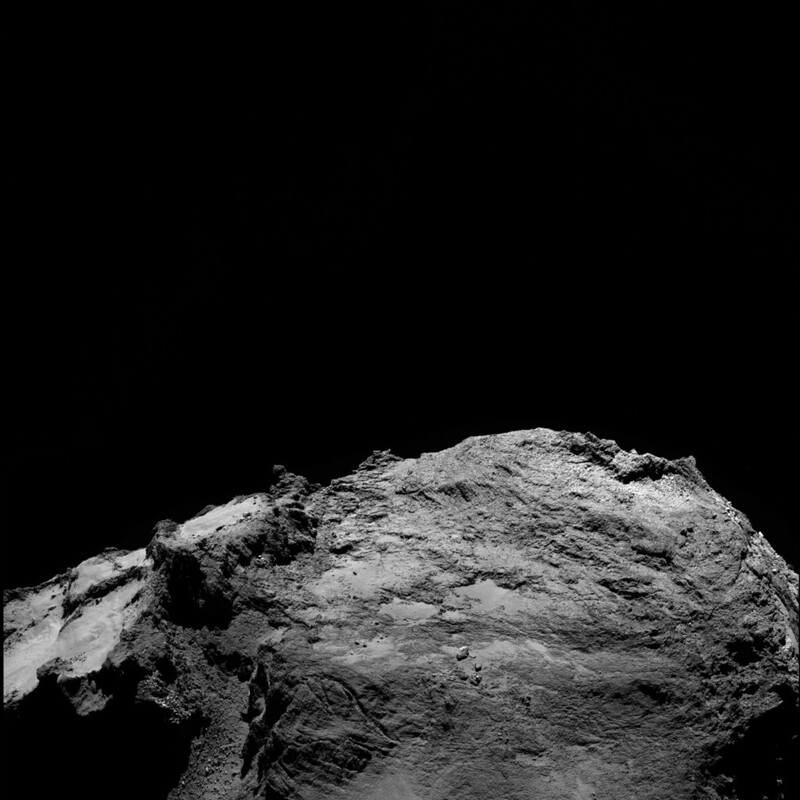 Comet 67P does not look like a dirty snowball or an icy dirt balls. More like a dense frozen chocolate cake where the basic structure is fused together so once the volatiles are lost you are left with a solid structure with a dusty surface. What caused the structure to fuse together? 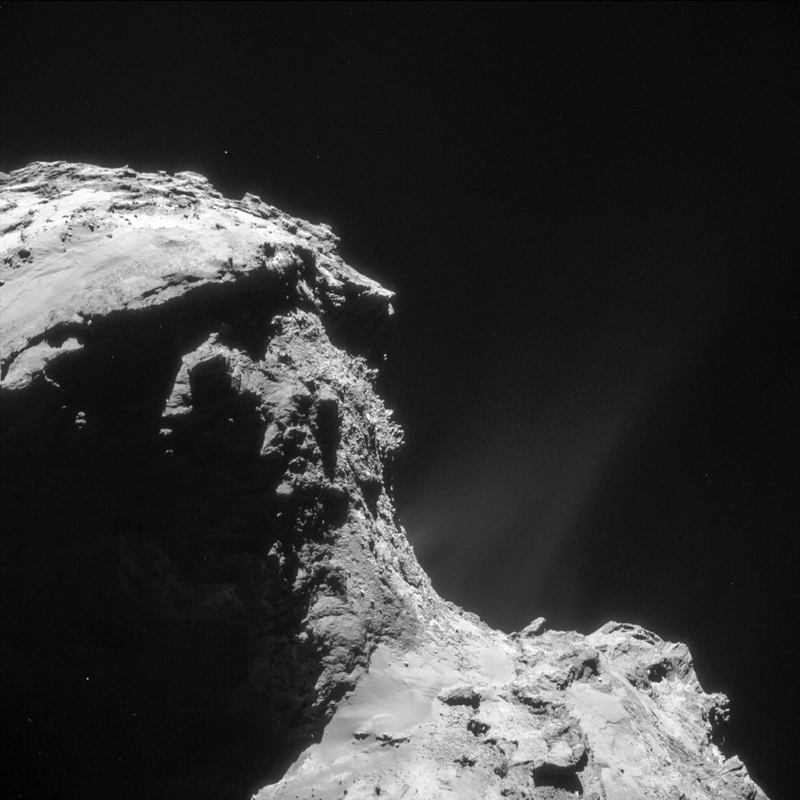 What are the Rosetta scientists saying? Could we get some information about Rosetta’s trajectory please? A visualization of the last few months of the trajectory would be great. I recently noticed that a new application has been added on the blog’s main page called “Rosetta Now”. Unfortunately I haven’t seen any announcement on this behalf by the blog team. The device can be used to replay the orbiters trajectory up to the day of the wakeup in 2014 in real time as well as in high speed mode !!! Spectacular scenes i.e. on 2015-02-14, when Rosetta had its closest flyby up to 8 km so far!!! Date and time can be adjusted via the buttons. The device has been developed by ESAC in Madrid to design Rosetta’s trajectory. It displays the actual position of the Orbiter in relation to the comet, what is important for the different science teams to adjust their various instruments. I have been in contact with Bjoern Grieger, one of the developers, for some time. There may some adjustments to the direction of view for the upcoming “landing attempt” of Rosetta which hopefully will become another spectacular scene to be watched in “Rosetta Now”. All in all – a great feature to attend the Rosetta Mission as close as possible. Thanks, Thomas, enjoyed seeing that. Thanks a lot, I’d not spotted it. Back at 14km! Yes, “Rosetta Now” is an interesting feature, I check it regularly. However, it is not so informative as I wish it would be. It lacks a proper 3D visualization of Rosetta’s trajectory around the comet and information about what scientific instrument is currently active with the field of view of the instrument (where it makes sense) projected over the comet. Emily: Thanks for all the views of the activity. The close views we have seen of the southern hemisphere so far reveal several overhang/cave-type features inside which something is cooking. Would be interesting to see if there are sinkhole-type features (as in Seth in the picture above).